2019.03.14 - Happy Pi Day. I've updated my KML collection of ancient monument pi relationships several times over the last year. The additions reflect recent research, including a focus on some of the oldest Neolithic monuments in Europe. Archaeologist Bettina Schulz Paulsson examined several thousand radiocarbon dating results from European Neolithic sites and published an article and database listing the oldest sites. I examined the relationships of the oldest monuments, and one of the relationships expresses pi quite precisely. From Er Grah Tumulus the arc distances ratio to Barnenez Tumulus and to Windmill Hill is one to pi. Windmill Hill, the 5,000 year old Neolithic causewayed enclosure, is part of the Avebury World Heritage Site and the type site of the Windmill Hill culture. Barnenez and Er Grah in Brittany have recorded older dates, making this pi monument relationship as old as Windmill Hill's circular henge. I'm celebrating #PiDay by posting KML files. 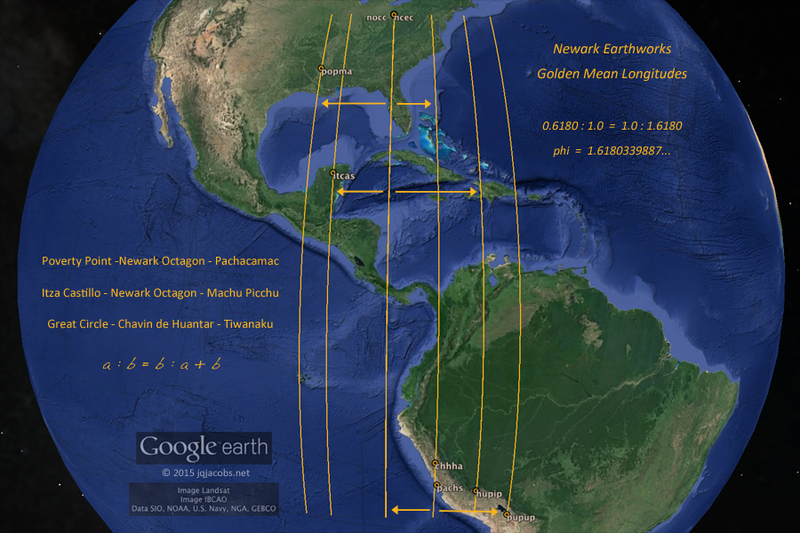 Ancient Monument Phi Ratios is an updated version of the 2015 Golden Mean Longitudes file with more results. Yes, that's Phi, not Pi. I needed to replace dead link Panoramio image embeds with Web Archive photos, so I updated the entire file, reformatting, adding new research results, more placemarks, and more photos and graphics. Included is a Xiang folder featuring the phi latitude of Emporer Qin's tomb. The table below presents one of the placemark balloons. Stated simply, the golden mean or golden ratio divides a line such that the whole is proportional to the longer part as the longer part is to the shorter part. The golden ratio, x : 1 = 1 : x + 1, stated numerically is 0.618034. : 1.0 = 1.0 : 1.618034, where Phi like pi is an infinite irrational number (1.6180339887...). Upper case Phi represents 1.618... and lower case phi is 0.618..., Phi - 1 = phi. I tend to ignore the Greek, italicized upper and lower case convention, refer to both in lower case, and reference the ratio moreso than the values. The formula obtains from a triangle with sides 2 : 1 and thus a hypotenuse equaling the square root of five. The values equate to half of two sides, [(the square root of five plus one) divided by two] and to [(square root of five minus one) divided by two]. The x - 1 = y and x + 1 = y formulations have relevance in astronomy orbit ratios. Meteor Craters - During the last year I followed a social media link to an article about the world's best meteor craters. I surprisingly learned a recent Pleistocene crater in Saharan Africa, Tenoumer Crater, is about the same age as the oldest known rock art. 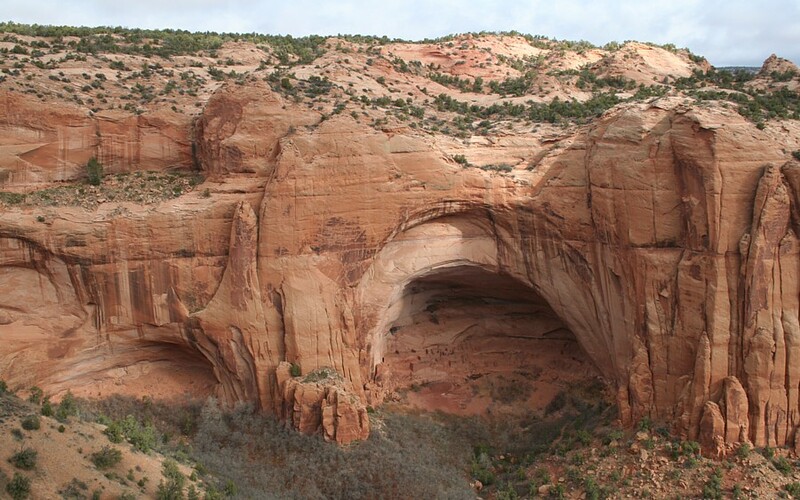 Of course, I wondered if modern humans were aware of the impact at the time and what import these landscape features had to later people. 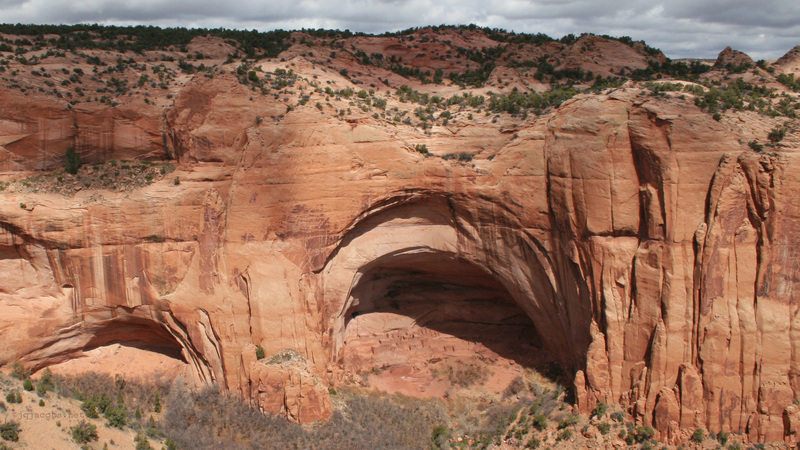 I've long wondered if the similarity of earthen henges and meteor craters is more than coincidence. I placemarked and measured some of the craters and checked their relationships to the major monuments which most resemble them. 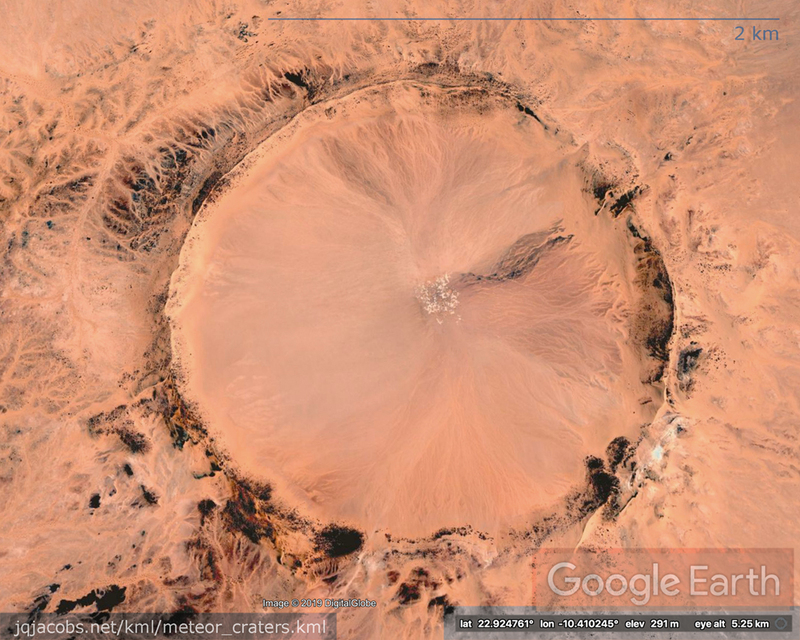 Another Saharan meteor crater, Aouelloul Crater, is the same size as Avebury henge. Two of the major monuments in the Phi KML file, Machu Picchu and the Sun Pyramid express a phi arc distance ratio with Aouelloul Crater. At the Giza pyramids the center-on-center arcs distances ratio to Avebury and to Aouelloul is five to four. Late Pleistocene Tenoumer Crater, at two kilometers across, is larger than Aouelloul Crater, as wide as the spacing of the Newark Circles. The Tenoumer Crater walls would fully encircle Avebury's henge circle and Silbury Hill. 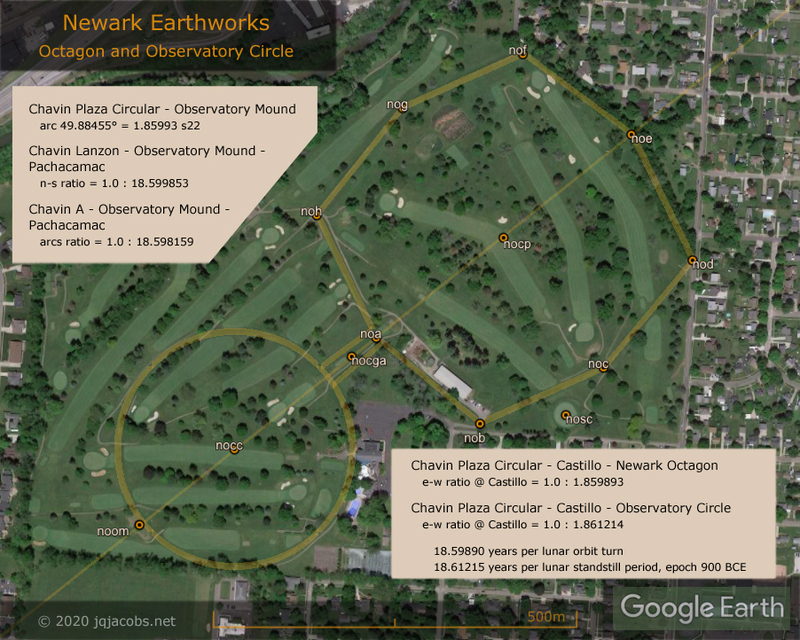 The center-on-center arc distances ratio from Avebury to Newark's Observatory Circle and to Tenoumer Crater expresses the solar orbits per lunar standstill period constant seen in so many other Newark relationships. From Newark Octagon the same ratio is expressed by the arc distances to Machu Picchu and Huangchengtai, the Chinese Neolithic capitol recently in the news when excavations revealed a massive stepped platform mound. Of course the news reports led me to find the academic reports and placemark the location. I noticed the Shimao walled city's latitude is near one-seventh of circumference from the pole. Avebury is precisely one-seventh of circumference from the equator, so the latitude ratio of the two locations is about three to four. I therefore checked the site-to-site relationships and noticed the number pi. The arc distance from the Shimao stepped mound at Huangchengtai to Silbury Hill, the immense mound at Avebury, equals 72.3427 degrees, and the tangent of 72.3432128485871... degrees equals pi. Coming soon, a new Machu Picchu Archaeogeodesy article and KML file. Contact me for a preview of the KML file.